During my little hand embroidery journey I realised I don't seem to work traditionally, using a pattern. I think coming from an illustrative background means that I naturally tend to stitch things freehand, just like I would draw them. In fact when I attempted to make a pattern myself and follow it, I found it way harder than stitching without one because of having to follow constraints. Usually I sketch out ideas in a notebook as they come to me and then draw freehand onto the fabric with a pencil. If I was trying to create something symmetrical or something very complicated, I would probably make a pattern for myself to transfer to the fabric. Because of this I thought I would trial making a little pattern for a 3.5 inch hoop. I also wanted to play around with using a limited amount of coloured thread. I remember when I was first learning to oil paint and the teacher forced us to use limited colour palettes, because your natural instinct is to throw every colour at your painting. This doesn't always give the best outcome though, especially when you're learning. For a simple design like this embroidery pattern I used only five colours and (I think) only three types of stitch. This kind of limitation was meant to make it easier to translate into different colours without changing the design completely so I could maybe have a colourful version, and a dark one, light one etc. I chose to use jewel tones of dark red and purple with some yellow gold threads which was meant to compliment Autumn/Winter tones but now that it's finished I feel like it references more colourful Indian designs. Completely unintentional but sometimes it's nice when things turn out differently than anticipated. Once you have the pattern, you need to trace it onto the fabric. You can do this through a lightbox if you have one or just hold it against the window and use sunlight, like I did. I usually draw on fabric with a pencil but for the purposes of sticking to a clear line I used a pen. I used a normal unipen fine line in 0.1 but many people use fancy pens where the lines disappear over time. You could do this, it's probably more helpful but I tend to flit between projects so a pen like that would have faded by the time I got back around to this. Again, I usually draw on the fabric once it's already in the hoop but for this I drew it on before I stretched it in the hoop. Mainly because it seemed easier that way. So, I'm pretty sure I only used three types of stitch in this. I get a little over excited when learning new stitches or even better, accidentally coming across a new stitch when you mess up the one you were trying to achieve, but for this I used Satin Stitch, Chain Stitch (my favourite) and made some cute little French Knots. 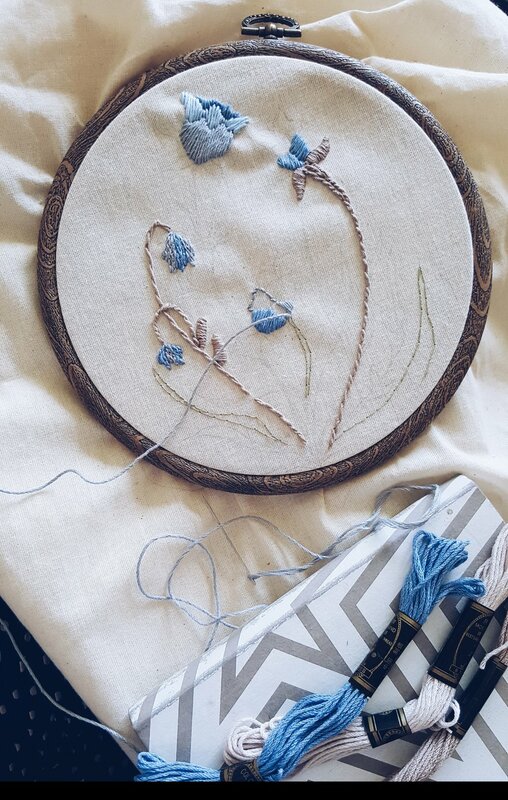 I used a slight gradient effect on some of the larger flowers by using two similar colours of thread or sometimes two contrasting colours, but not in a way that's really complicated or hard to do. It does add more depth to the design and coupled with using a backstitch under every shape, makes the motifs stick out from the fabric a little further. Regarding colours, I picked five threads for this pattern. I chose a dark kind of claret red, two shades of purple, one dark and one slightly lighter, a golden yellow and a slightly different yellow (with a pinkish undertone) The reason for this is picking colours that are varying shades is a really easy way to make sure the finished piece looks consistent. Having two shades of a yellow/gold colour means I could use both in one part as a gradient and also makes it stand out against the red and purple. Obviously you don't have to use the same colours that I did. If you use two shades of one colour, two shades of another and then one contrasting colour (five altogether) you should get the same effect. You can see here I backstitch around any of the larger shapes before making single stitches around it from the outside, in. This is because it's easier to make sure your stitches are going in the right direction. If you're stitching an outline of a circle for example, it's easy to make it look messy by stitching at the wrong angle. This, coupled with the backstitch underneath makes the shapes puff up and looks way better than flat stitching. I tried to stitch a gradient into each of the larger motifs, as shown above. Even though the two colours of yellow are quite similar, you can see in close up that the slight pinkish shimmer before it goes into red, really makes a difference. Sometimes it's nice to have a clear, defined line between colours, but it can look really nice and more painterly when blended like this. You can also see the chain stitch next to it. I used this for all the lines and stems in the motifs. Everything was stitched with x2 threads of the same colour. This is my favourite to use but you could use x1 thread if you wanted it to look finer. I would avoid anything thicker because there are only small gaps between shapes in the design and if you lost the gaps it would all become a bit of a mess! 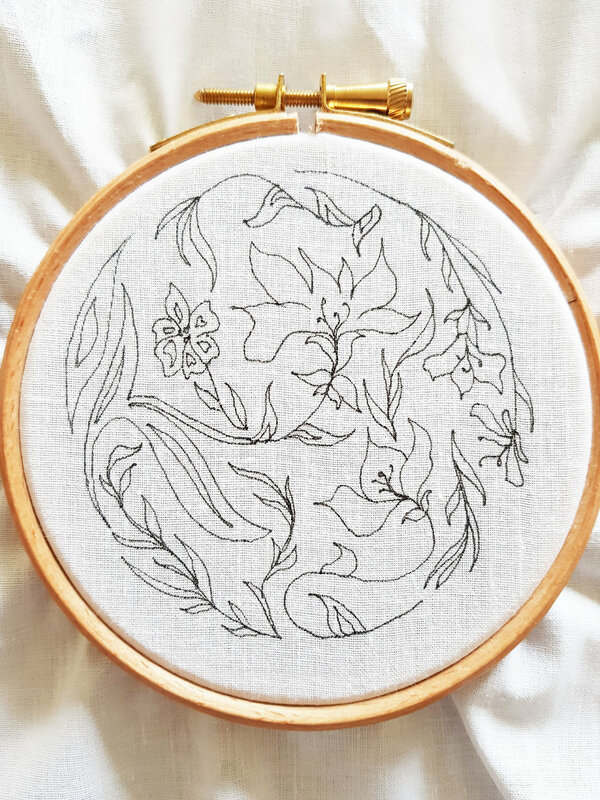 To download a file containing the embroidery pattern I used, please go to my Studio Shop and add the free embroidery pattern to your basket (don't worry, it's priced at zero) follow the instructions and then you'll receive the file to download. Please note that the link is only valid for 24hours and that this is not a physical item. I kind of have a compulsive need to teach myself new things. I get bored/distracted/oblivious to the things going on around me and get really excited when I come across something new that I can concentrate on. It's been a bit like that with hand embroidery. I could basically just about sew a button on something before I actually put any effort in but now, after teaching myself lots of new stitches I'm bordering on obsessed with this new hobby. Also, I say I 'taught' myself, but really how invaluable is YouTube and Instagram for learning from other people? It baffles me that people can put that much time and energy into just putting something out there for free to help others entertain themselves or learn more. 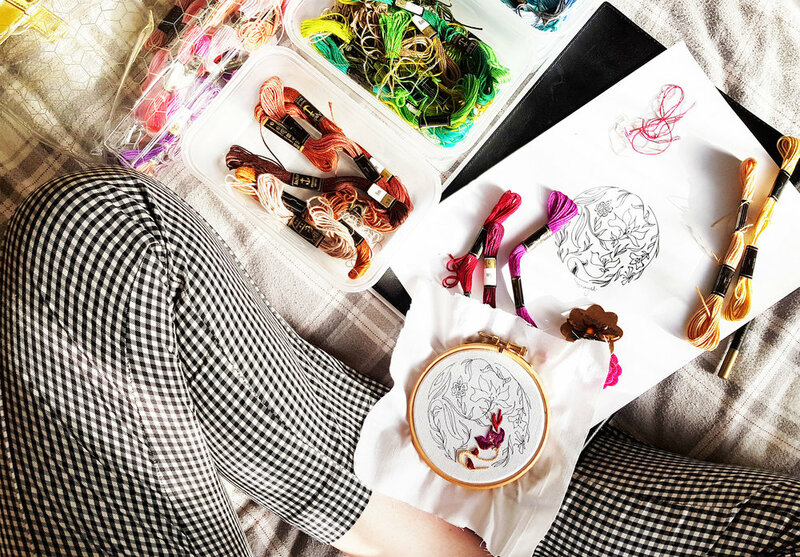 I really like Namaste Embroidery because she's really chill and fun to watch, also her style is modern and pretty, and Sarah Homfray in particular because she's so easy to understand and knows so much. It's fun to be able to draw in something other than pencil or paint and it's very addictive once you start. I mainly need to work on pace. I'm quite clearly very slow and the rate that other people can stitch is crazy to me but hopefully the more I carry on, the quicker I'll get. Working faster and scribbling ideas down in this tiny notebook is working out much better than concentrating on tedious, large pieces.